Two decades back, in 1998, Hala Equipment Trading began operations to provide quality material handling solutions for UAE’s burgeoning industries. Over the years, we have grown and diversified to become one of the key players in the country’s material handling and transport services sector. We are in the business of lifting and moving. And while we are at it, we lead the industry with our innovative products and consultative services. Lifting. Moving. Leading. – Our tagline is a reflection of what we do, and our mission is to be the best in everything we do. The Hala story is rooted in an unwavering commitment to the people who work for our company, who in turn have a sincere focus on providing our customers with superior solutions that help their businesses develop. Started by Mathew Abraham, a Mechanical Engineer with passion for heavy equipment, Hala has now transformed into a large business enterprise serving the whole of UAE and various other parts of the world with quality forklifts, wheel loaders, service and parts. Mathew came to the UAE as a Works Manager at Jebel Pack at the end of 1996. But, an entrepreneur at heart, he was restless and wanted to embark on his own. Spotting an opportunity for reasonably priced forklifts, he set up Hala. He began by personally sourcing and importing used forklifts from Japan. These forklifts were reconditioned at his yard and then sold in good working condition. The reliable and professional after-sales service provided was a key factor in Hala’s success. Over the next few years, Hala expanded its business. In 2002, Hala was the first to introduce Sideloaders in the UAE to efficiently handle freight containers. In 2006, Heli, the world’s 10th largest forklift manufacturer, made Hala their sole distributor in the UAE. Hala’s 20 years of experience in dealing with forklifts of all types has turned into viable and sustainable business model, covering the complete supply chain for Material Handling Equipment for Dubai, Abu Dhabi, Sharjah, Ras Al Khaimah, Fujairah, Umm Al Quwain and Ajman. We also support the the East Coast and Northern belts of Africa from the UAE. Hala Equipment is launching Cesab, in association with Modralog. 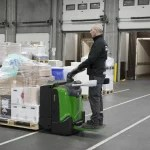 Born in 1942, Cesab’s advanced heavy-duty forklift trucks are designed for high productivity, maneuverability, reliability and ease of operation. 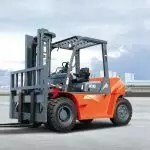 Cesab Forklifts are renowned for their unique patented mast design, which incorporates a transitional lift system for fast and seamless mast operation. Heli is China’s No. 1 Forklift manufacturer, the world’s No. 7 brand for material handling equipment and is known internationally for its tough and efficient forklifts. Founded in 1958, Heli today produces about 100,000 units in a year and is a public company listed on the Shanghai Stock Exchange. Hala is the sole distributor of Heli Forklifts in the UAE since 2003. Our sales teams are constantly trained at the Heli factories in China to ensure that there is an in-depth understanding of each product that we bring to the market. We are also in constant touch with our clients in the UAE to help us bring about relevant improvements to our products and ensure that we are always in the forefront of innovation. Our service team includes 30+ safety-trained qualified staff for handling all types of service and repairs. With extensive experience, each service engineer has practical, hands-on knowledge of service and repairs of heavy equipment covering Mechanical, Hydraulic, Transmission, Electrical and Electronic systems. Their knowledge is further enhanced, by training programs from Heli. Our well-equipped spare parts department can provide the correct parts at the most affordable prices within the minimum possible time to you. With this aim, we have a large number of line items in our Central Parts Depot located in Sharjah Industrial Area. We also have a climate controlled environment dedicated for sensitive parts. The Parts Department is managed by professionals with vast experience, ensuring that every Hala customer’s order is handled quickly and efficiently. We have a full range of equipment including Forklifts, Wheel Loaders, Attachments and Tow Tractors. You can choose to buy or rent out our Forklifts. We also have our container grounding side-loading trucks, which make grounding your containers an easy process. Hala is a stable, well-established company with a multicultural environment. We regularly provide customized training and focused career development programs. Working at Hala opens up a wide range of opportunities for candidates from all walks of life, from fresh graduates to experienced senior executives. Our corporate culture makes employees believe that there is always a solutions to every problem. We don’t see obstacles as a dead end bus as a challenge towards new experiences, unlocking potential and honing competencies. The success of Hala has never been about a one man show but a warm and harmonious super team. Come join us.